Stormtrooper height is a surprisingly contentious bit of Star Wars minutiae, one that’s raised questions on and off screen. And it appears to be the reason why a couple of royal cameos in The Last Jedi ended up on the cutting room floor. Last year, Princes William and Harry were rumored then confirmed to be following in Daniel Craig’s footsteps and joining the First Order. Unlike Craig, they weren’t given any lines, though, so when The Last Jedi premiered in December, audiences and royalty safely assumed they were two of the stormtroopers we saw running around at various points in the film. But, according to The Telegraph, their cameos were cut because they were “towered” over their fellow soldiers. 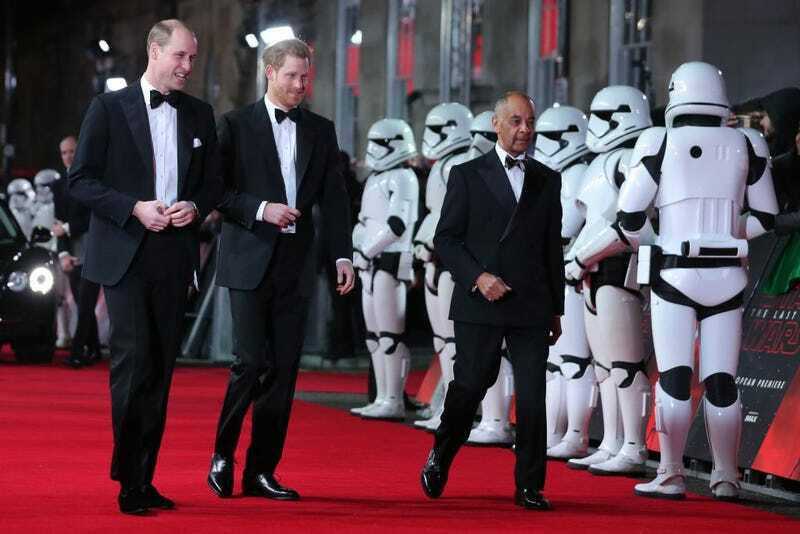 Prince William is 6'2" while Harry is 6'1", but a source says the average stormtrooper is only 5'11". There’s no word on how the princes feel about being left out of Episode VIII, but it looks like John Boyega was right after all.